They carried him out on a stretcher. The doctor said it was a heart attack; nothing anyone could do. Aged 61 recently retired…. it is an unfortunate script that is played out every day in family homes around the world. At least he didn’t suffer the doctor said, since it happened while he slept. Despite dramatic medical advances over the past 50 years, heart disease remains the leading cause of death amongst humans accounting for 42 percent of all deaths worldwide. In the US alone one person dies every 33 seconds from heart disease which is over 2,600 people every single day! One-half of the victims are under the age of 65. Over 20 million people survive heart attacks and strokes each year many requiring continuing costly medical care. The very sad thing about these frightening statistics is that much of this is preventable. Heart disease is considered a “lifestyle disease” which means it is caused by your lifestyle and the way you live your life. People who are sedentary are almost twice as likely to suffer heart attacks as are people who exercise regularly. This means your health is dependent on your many habits and two of the very important ones are how active you are and the quality of your nutrition. Your heart after all is a muscle just like any other. You can beef it up and keep it strong, or you can let it get scrawny, unfit and weak. The heart is not some mysterious beating organ, but rather a pure, powerhouse muscle that responds to vigorous activity the same way regular muscle does. Strength training exercise is the type of exercise that you must do to keep all of your muscles strong and healthy including your heart. Like your other muscles your heart becomes stronger and larger as a result of strength training so it can pump more efficiently. It then doesn’t need to pump as often even when its owner is sleeping or resting. The resting heart rate of those who are strong and fit is slower because less effort is needed to pump blood meaning it doesn’t have to produce as many beats per minute to pump the same amount of blood. Although it is beating slower it is more efficient. If you slow your pulse from 70 to 60 beats per minute by increasing your strength and fitness you will save your heart from beating over 14,000 times a day. Over the course of a lifetime this means over 5 million heart beats saved, reducing wear and tear on the heart and blood vessels. In other words, our heart becomes a more efficient machine producing less beats over a lifetime which correlates with our living a longer life. We often mistakenly think that cardiovascular (long duration, low intensity, repetitive) activity is essential for heart/lung conditioning but this is incorrect. It is the muscles that demand blood from the heart system not the other way around. Strong muscles mean a strong heart assisting in pushing and “milking” blood around the body taking some of the load off it making its job easier. That same long, slow, low intensity activity has now been proven to make the heart/lung system smaller and weaker than what was previously believed. Downsizing the body’s major pump is not a healthy thing to do as it increases the risk of disease. This is why strength training is the best type of exercise for a strong heart and lungs. 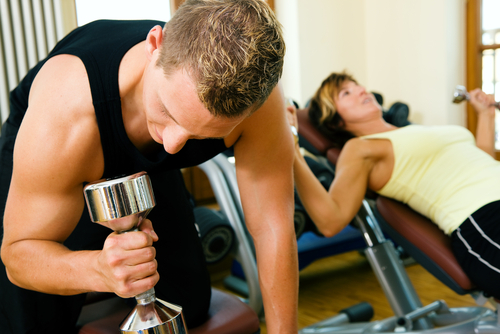 Why exactly is strength training so beneficial? Well, it’s because when you perform strength training exercise at a moderate intensity where you get your heart rate up and keep it up, strength training can simultaneously engage both the muscular system and the cardiovascular system. Basically, when you make your muscles stronger, you make your body stronger, which helps everything but in essence having strong muscles takes strain off the heart. Strong toned muscles perform better with less oxygen which means the heart does not have to work as hard when you exert yourself. Strong muscles help circulate blood around the body as their firmness and tone squeezes blood vessels every time you move acting as auxiliary pumps. This reduces the workload on the heart meaning the heart doesn’t have to pump as hard when you are active. By extension, strong muscles are good for your blood pressure. The opposite occurs when the body’s muscular system is allowed to lose strength and become weak and flabby when not enough muscle building and maintaining activity is done. This can put much more strain on the heart. You often see this when people stupidly go out and run a race and drop dead in the process. But this does not have to be you if you take action and get started on a strength training program as your protective measure against the ravages of this silent killer disease. If you do not take this as your responsibility you more than double your chances of heart disease. Don’t let inactivity and a sedentary lifestyle shorten your one and only precious life. You must surely want to be around to get to know your grandchildren but first you have to be around to even get to meet them don’t you?